As I spend more and more time at my desk, I have been putting my wrist into a comprising position for extended periods of time. Naturally, this is had to my wrist pain. So I decided, it was time to fix the root cause - to find the best ergonomic mouse on the market! I searched far and wide, read reviews and consulted with specialists who understood the human body better than anyone I know... And I found the best ergonomic mouse that money can buy! In this article, I will look at the relationship between the traditional computer mouse and posture. I’ll explain to you why usage of the traditional computer mouse is not optimal, and why you need an alternative ergonomic design, such as an angled mouse, to keep your hands and wrists healthy. There are a lot of other variables that influence your posture when working on a computer behind a desk: whether your shoulders are held low or high, whether your spine is extended, whether your feet touch the ground, and whether your neck position is optimal. All these variables influence how well a posture can be maintained for long periods of time, or whether you develop pain or injuries through (poor) posture. The traditional computer mouse has not been designed to be used eight hours a day, for decades on end. The traditional computer mouse – that you find almost anywhere – puts you at greater risk for arthritis, wrist tendonitis, or carpal tunnel syndrome. 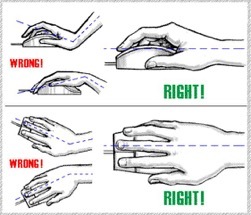 The reason you’re at risk for these health risks when using the traditional computer mouse, is because the mouse puts your wrist in a very unnatural position. Essentially, traditional computer mice put your hand in a pronation position for too long. The bad posture that is the result of the use of the traditional computer mouse does have consequences. When you’re making the same movement over and over again under the influence of bad posture this can increase inflammation in hand and wrist. Traditional computer mice also puts you at risk of developing peripheral nerve problems in the wrist and hand. These were all issues that I started noticing. And I'm sure there are many others out there suffering the same problems. So how do we fix this? How should the perfect computer mouse function? 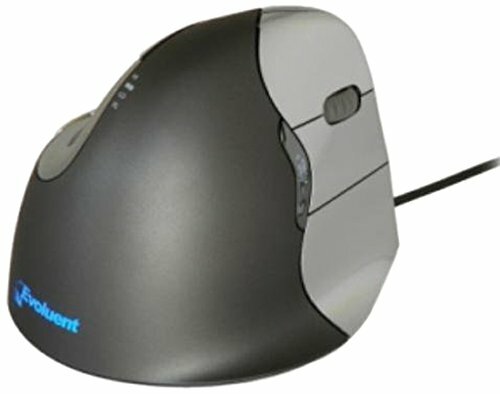 What are we after when searching for the best computer mouse? Maximum comfort and performance as well. A lot of scientific studies have investigated new mouse designs in the last decade. What’s most important, is that the new computer mouse should be healthy for our hands and wrists. 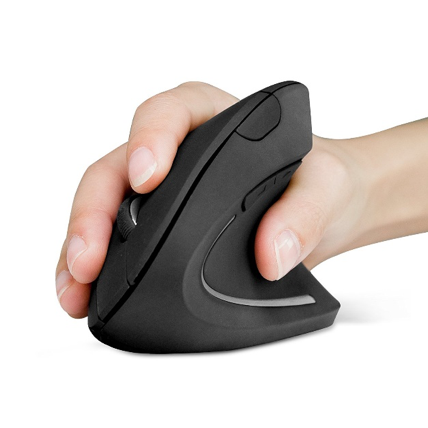 Several mouse designs have been scientifically investigated for this criterion, and studies conclude that a vertical mouse, or an angled mouse, is the least stressful on the hands and wrists. It’s important not to wait too long for buying a healthier mouse when you have wrist issues, because changing your mouse after you get wrist problems – such as carpal tunnel syndrome – might not quickly reverse the underlying issue anymore. Studies do show that alternative mouse designs, such as vertical or angled mouses – compared to the traditional computer mouse – dramatically reduce the extent to which the wrist is placed in a bad posture. Next, the perfect mouse should be comfortable to work with. Scientific studies actually show that the angled design is the most comfortable to work with. We’ll keep that in mind when selecting the perfect mouse in this search. In addition, we want the computer mouse to be wired, instead of wireless. Most computers already give you non-native EMF exposure that does not benefit your health in any way. Non-native EMFs are electromagnetic frequencies are emitted from certain devices, such as cell phones, cell towers, but also electronics like wireless computer mice. You should thus avoid a wireless mouse whenever possible. 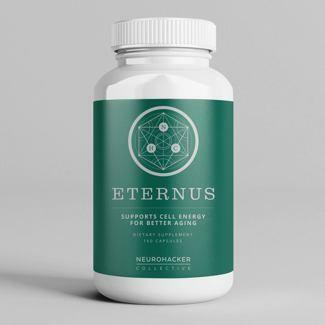 Because I’m also working on my computer for many hours a week, I therefore want to minimize my non-native EMF exposure as much as possible. So, the perfect computer mouse should be connected to the computer with a cable – preferably though an USB connection. Lastly, you’ll still want to be able to actually get your work done with the computer mouse you’re choosing. So, the ergonomic design of the perfect computer mouse should not make you work more slowly. Scientific studies show just that: new mouse designs allow you to work just as fast as you could with the traditional computer mouse, and sometimes even faster. I’ve identified several candidates that would function as the perfect mouse. Their prices range from very cheap, at a $15-20 range, to more expensive computer mice at $80+. The main difference between these prices is comfort. 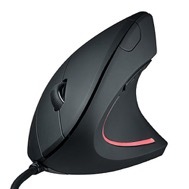 The first Alex Approved ergonomic mouse is the “Sharkk Ergonomic Mouse”, which costs $20. The mouse is well-built and lowers the amount of pain that people experience when working with a computer mouse. However, the only drawback is the comfort you’ll experience when working for long-hours behind a computer screen. 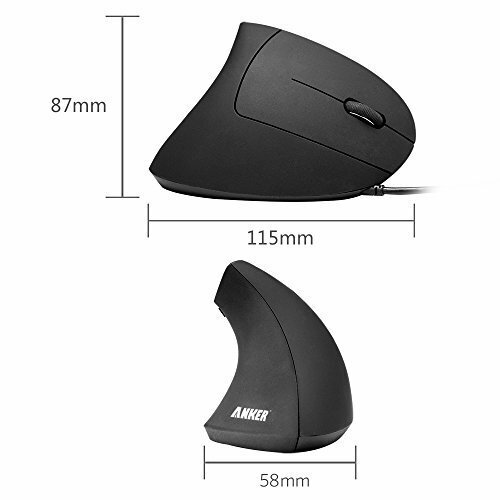 A cheaper alternative to the shark is the “Anker Ergonomic” mouse, but users report that it does not last as long and might not give perfect comfort. Though upon closer inspection, it looks like an identical mouse to the Sharrk one listed above. Yet it is a lower price and has more reviews on amazon. It may be worth doing your own research to determine the differences. Either one look OK in my eyes. Flexion and internal rotation of the forearm and shoulder is a biomechanically unstable position when in an open chain, which is what is happening at a desk with a hand on a mouse. Whilst the hand is in contact with something, it is not being used as a fixed segment and thus is essentially floating in a biomechanically non preferred position that places strain on levator scapuli as it eccentrically holds on for dear life to support the shoulder girdle. This commonly gives rise to right sided shoulder and neck stiffness. The evolutent vertical mouse allows one to have their arm hang by their side with the forearm relatively supinated to neutral. With the elbow now closer to the trunk there is less strain on the shoulder girdle and neck and shoulder pain disappears. He went on to say that he used the Evoluent Mouse and recommended it to all of his clients. 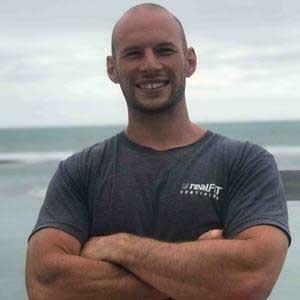 I know how much Josh know's about the body, healing, and health, so forking out the extra pennies to go with the Evoluent was the obvious decision for me. 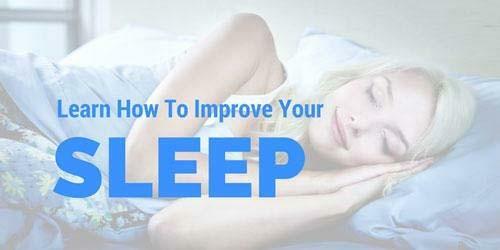 When you choose the perfect computer mouse, you’ll not only prevent health problems, but also increase your productivity when working at the computer: people who are not in pain, can just get more stuff done. And research has already shown that you can work just as fast with an angled mouse. For me, writing this 6 weeks after upgrading from a traditional mouse to the evolutent vertical mouse I am now 100% wrist and elbow pain free. Sure it felt strange using a vertical mouse to begin with, but after a few days I was completely used to the new setup. In fact, using a traditional horizontal mouse now feels strange! If you experience wrist pain when using your mouse, hopefully this article explains why this pain is occurring and has presented you with some solutions. If you never experience wrist pain, but want to care for your body, maybe it's time to upgrade your mouse! 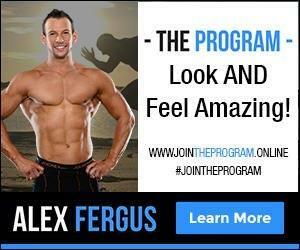 If you benefited from this article please leave a comment below or share it on Facebook. Tiric-Campara M, Krupic F, Biscevic M, Spahic E, Maglajlija K, Masic Z, Zunic L, Masic I. Occupational overuse syndrome (technological diseases): carpal tunnel syndrome, a mouse shoulder, cervical pain syndrome. Acta Inform Med. 2014 Oct;22(5):333-40. doi: 10.5455/aim.2014.22.333-340. Epub 2014 Oct 29. Keir PJ, Bach JM, Rempel D. Effects of computer mouse design and task on carpal tunnel pressure. Ergonomics. 1999 Oct;42(10):1350-60. Barr AE, Barbe MF. Pathophysiological tissue changes associated with repetitive movement: a review of the evidence. Phys Ther. 2002 Feb;82(2):173-87. Al-Hashem FH, Khalid ME. The effect of long-term use of computer mouse devices on median nerve entrapment. Neurosciences (Riyadh). 2008 Apr;13(2):131-5. Odell D, Johnson P. Evaluation of flat, angled, and vertical computer mice and their effects on wrist posture, pointing performance, and preference. Work. 2015;52(2):245-53. doi: 10.3233/WOR-152167. Schmid AB, Kubler PA, Johnston V, Coppieters MW. A vertical mouse and ergonomic mouse pads alter wrist position but do not reduce carpal tunnel pressure in patients with carpal tunnel syndrome. Appl Ergon. 2015 Mar;47:151-6. doi: 10.1016/j.apergo.2014.08.020. Epub 2014 Oct 3. Gaudez C, Cail F. Effects of mouse slant and desktop position on muscular and postural stresses, subject preference and performance in women aged 18-40 years. Ergonomics. 2016 Nov;59(11):1473-1486. Epub 2016 Apr 8. Dehghan N, Choobineh A, Razeghi M, Hasanzadeh J, Irandoost M. Designing a new computer mouse and evaluating some of its functional parameters. J Res Health Sci. 2014 Spring;14(2):132-5.